But like graphene, h-BN is a good conductor of heat, which can be quantified in the form of phonons. (Technically, a phonon is one part—a "quasiparticle" – in a collective excitation of atoms.) Using boron nitride to control heat flow seemed worthy of a closer look, Shahsavari said. "Typically in all electronics, it is highly desired to get heat out of the system as quickly and efficiently as possible," he said. "One of the drawbacks in electronics, especially when you have layered materials on a substrate, is that heat moves very quickly in one direction, along a conductive plane, but not so good from layer to layer. 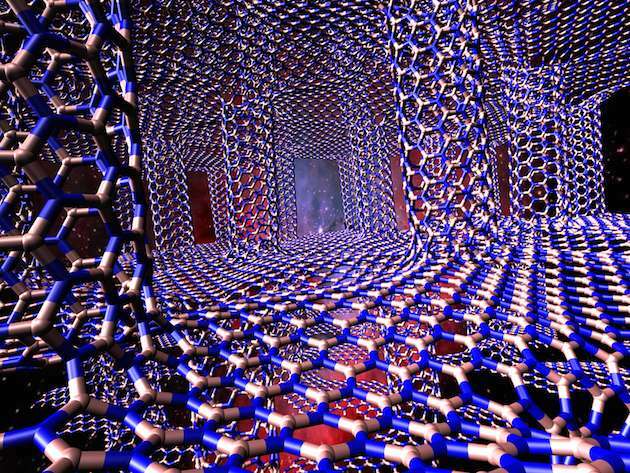 Multiple stacked graphene layers is a good example of this." While researchers have already made graphene/carbon nanotube junctions, Shahsavari believed such junctions for boron nitride materials could be just as promising. "Given the insulating properties of boron nitride, they can enable and complement the creation of 3-D, graphene-based nanoelectronics. "This type of 3-D thermal-management system can open up opportunities for thermal switches, or thermal rectifiers, where the heat flowing in one direction can be different than the reverse direction," Shahsavari said. "This can be done by changing the shape of the material, or changing its mass – say one side is heavier than the other – to create a switch. The heat would always prefer to go one way, but in the reverse direction it would be slower." So if I put that material between two compartments that experience uncorrelated temperature fluctuations, one of them would heat up? And if that works at small enough scales, wouldn't this be Maxwell's demon? I never learned a lot of thermodynamics, so what does this mean for the second law? So if I put that material between two compartments that experience uncorrelated temperature fluctuations, one of them would heat up? Not infinitely so. Transport will still be along the gradient from hotter to colder. It just means that when area A is hotter transport towards area B will be slower compared to heat transfer towards area A when area B is hotter.